In honor of those who served…Memorial Day special! Posted May 24th, 2013 by a_russell & filed under Uncategorized. Monday is Memorial Day – a day to remember those who lost their lives fighting for our freedom. My dad served with the U.S. Marines and has many stories, but he rarely ever shares them, so when he does share one, it’s special. Private First Class Johnny Burns was one of the men stationed with my dad in Dahnang, Vietnam and training towards taking my dad’s position. One day, Johnny asked my dad to wear his helmet to battle – my dad had worn the helmet when he was wounded by a grenade and Johnny thought it saved my dad’s life so he also wanted to wear it to keep him safe. Private First Class Burns died serving his country on that mission. In fact, my father could have easily been the one with that helmet, and if that was the case, I wouldn’t be here today. Memorial Day means a lot to me, because it makes me think of all the people, like Johnny, who fought and lost their lives for our freedom. They fight and risk everything for our country. They leave loved ones, children and their home to fight for us. 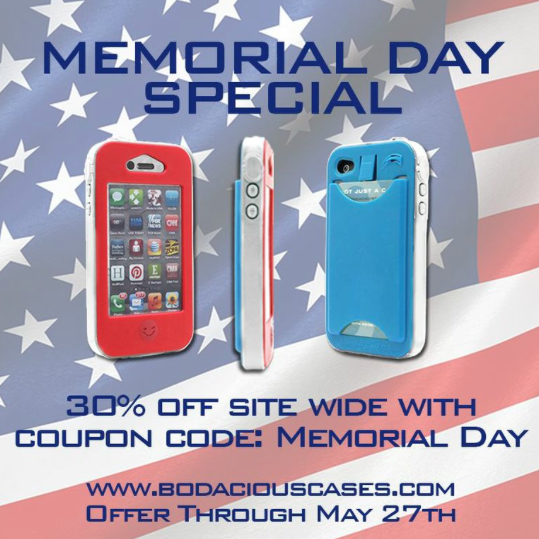 Because of their service, Bodacious cases are 100% made in America. It doesn’t come close to what our armed services do, but to honor their memory, we’re having our BIGGEST SALE EVER – take 30% off our entire website in memory of those who served for us. Also, remember that for every 12 cases we sell for our USA Heroes Special, we give one to a hero serving our country. If you know a hero, even if they’re not military, but a firefighter, police officer, co-worker, teacher, coach or just someone you know, please email us at [email protected] to tell us why they are your hero – we might just give them a free Bodacious Case! Please, take a minute to share this post with your friends and family. Let’s show our armed services both past and present, how much their service means to us! Enjoy your Memorial Day weekend!